After a long night of homework, which included an all-nighter, junior Kaitlyn Ho makes her way to school. Despite having her daily Peet’s coffee, she stumbles into her classroom disoriented and half-asleep. According to the Food and Drug Administration, the average American drinks 300 mg of caffeine each day, while teenagers consume about 100 mg. Many students depend on caffeine to get through school and additional hours of extracurricular activities. Michelle Hamilton, Assistant Manager of Peet’s Coffee at Town and Country, takes orders from many Paly coffee lovers. Hamilton said many students purchase drinks with caffeine on a daily basis. 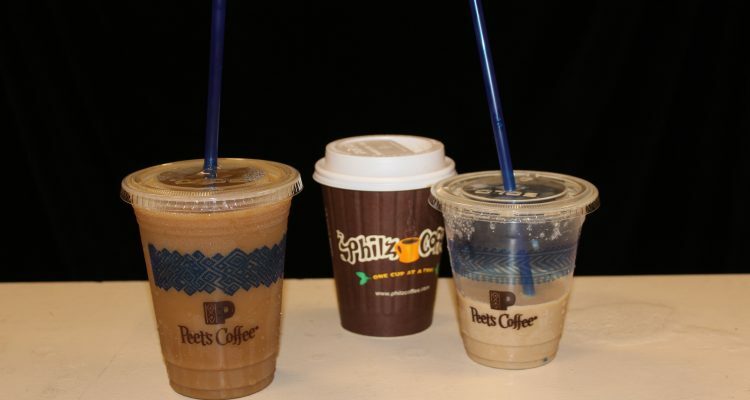 According to Hamilton, the Iced Latte is one of the most popular drink at Peet’s. This drink contains substantial amounts of caffeine; in a small sized cup, there is approximately 140 mg of caffeine. To put that in perspective, there is about 95 mg in the average cup of coffee, according to the United States Department of Agriculture. Some students say they drink up to three cups of coffee a day, especially on test-filled and homework-heavy weeks. That means that some students rely on caffeine for over 8 hours a day. This level of caffeine consumption is an exorbitant amount, especially for developing adolescents. “I drink more coffee during testing weeks because I want my brain to be actively thinking and remembering material while I am taking a test,” said freshman Atticus Scherer. While many students say coffee is a plausible option for successfully getting through the day, other argue that growing teenagers should not resort to caffeine. Caffeine is a vasoconstrictor, which causes a person’s blood vessels to constrict and heart rate to speed up. It is a drug that is addictive; regular coffee drinkers often depend on caffeine excessively. Most students drink coffee for the source of energy rather than the taste, which is one of the biggest problems in youth coffee consumption, according to Szebert. Those who drink excessive amounts of coffee can build up a tolerance to the caffeine, according to a research report by Jasvinder Chawla, a Neurology professor at Loyola University Medical Center. After a certain tolerance level, the amount of caffeine necessary to fulfill the drinker’s needs increases to the point where the drinker is encouraged to consume more caffeine than before. In fact, for those who have built up a tolerance to coffee or other caffeinated drinks, it is extremely difficult to abruptly quit drinking. According to Chawla, some people may even experience withdrawal symptoms such as headaches, dehydration, depression and fatigue.